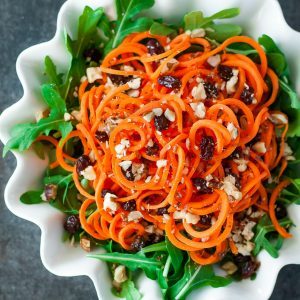 This healthy carrot salad is spiralized into crunchy carrot noodles and served atop a bed of mixed greens with juicy raisins, crisp candied walnuts, and a homemade lemon honey dijon dressing! No spiralizer? No problem! It works great with shredded carrots too! I spent nearly 20 years of my life thinking raw carrots served only one purpose: a shovel. More specifically, they were a shovel for scooping up ranch dip, licking it off, then discarding in a napkin when no one was looking. I’m not sure anyone caught on to my antics but I certainly wasn’t doing myself any favors in the health department. Luckily this ranch-obsessed carrot avoider decided to pursue a major in Dietetics and, by sheer guilt of my occupation alone, decided to give raw carrots a chance. Clearly I was missing out! Raw crinkle-cut carrots have become my shovel of choice for scooping up hummus and devouring that tasty chickpea dip, shovel and all. I no longer cringe when my salad is flecked with beta-carotene and, in fact, was once so bold as to order CARROT SALAD off a menu! Me! 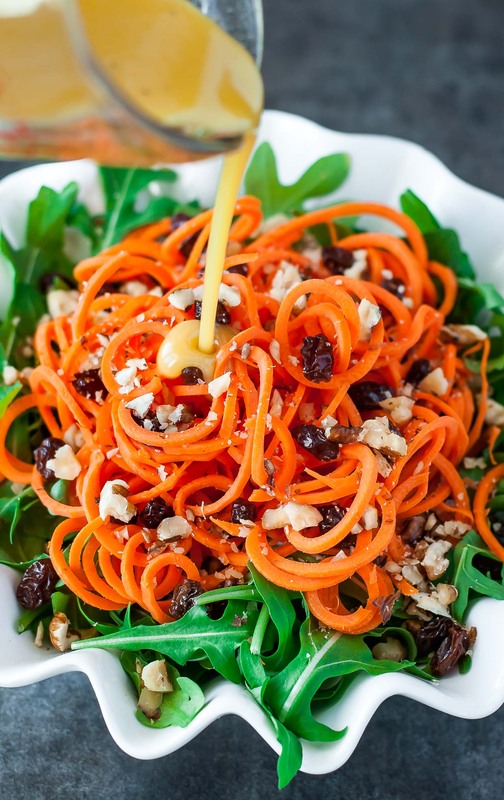 Carrot salad! Helloooo progress! You can imagine my disappointment when my order arrived and I learned what exactly carrot salad is here in the South. Shaved carrots smothered in mayonnaise and sugar with some random raisins thrown in for good measure was not my idea of a good time. Turns out I really DO like carrot salad, when it’s done my way of course! I started small, whipping up a spiral cucumber and carrot salad with a thai-inspired flair, then worked my way back to a traditional Southern carrot salad, deciding a face-lift was in order. Now that the cheezapalooza known as Super Bowl Sunday is behind us, let’s get back to those healthy goals we had for ourselves, shall we? I’ll ease you back into it slowly with some yummy candied walnuts to sweeten the deal. As written recipe yields one giant salad or two side dish-sized salads. Feel free to double, triple, or quadruple to feed your crew. Even my toddler can’t resist the lure of freshly curled veggie noodles. If you follow me on Instagram you’ve probably seen her happy dancing around the kitchen with a face full of cucumber noodles on any given day. Now if only I could get this munchkin to eat some dang green beans! 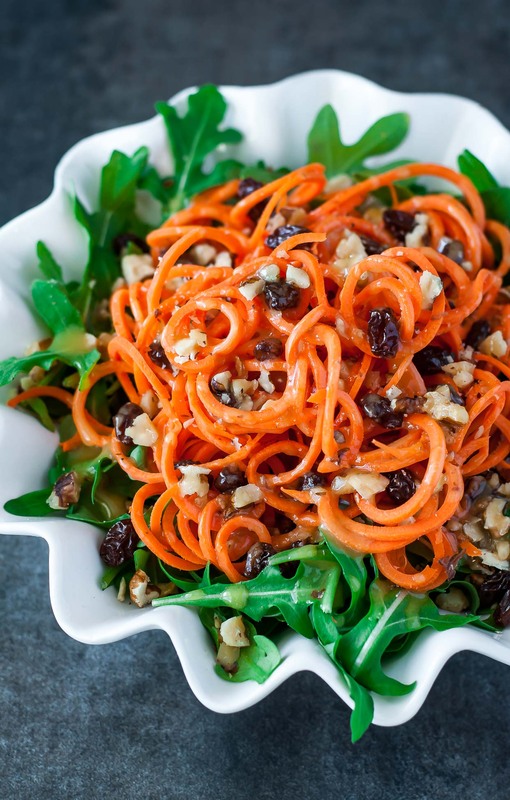 If you get a chance to try this healthy carrot salad, let me know! 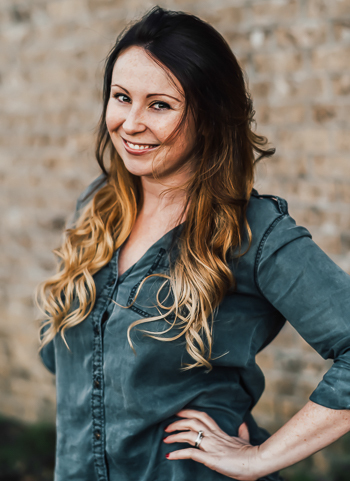 This post contains amazon affiliate links for products I use and love. Another one to pin…I am also like just about baby carrots as shovels or healthy side to a sandwich but I totally totally love this…you’ve inspired me to buy regular carrots at the grocery store, friend. I LOVE carrot salad too. We grow our own carrots and we cannot stand the store bought ones anymore, they just don’t taste of anything. I like to make a slaw with red onions, grated carrot and greek yogurt ~ it goes down a treat at BBQ’s. Great recipe Jenn, thanks! YUM. this looks great! except my spiralizer never works with carrots because they are too thin. It’s depressing. This certainly is a pretty salad and a healthy one too. Looks delicious. That looks gooooorgeous! I’m not even a huge carrot fan but that certainly looks awesome! Oooooh! This is one carrot salad I will deft eat. I despise mayo so obvi the standard kind is a no go for me. I must get myself a spiralizer soon! What brand do you use? Paderno – I love it! I just got a spiralizer for Christmas and having fun experimenting with it. Can’t wait to try the salad! this looks so yummy! 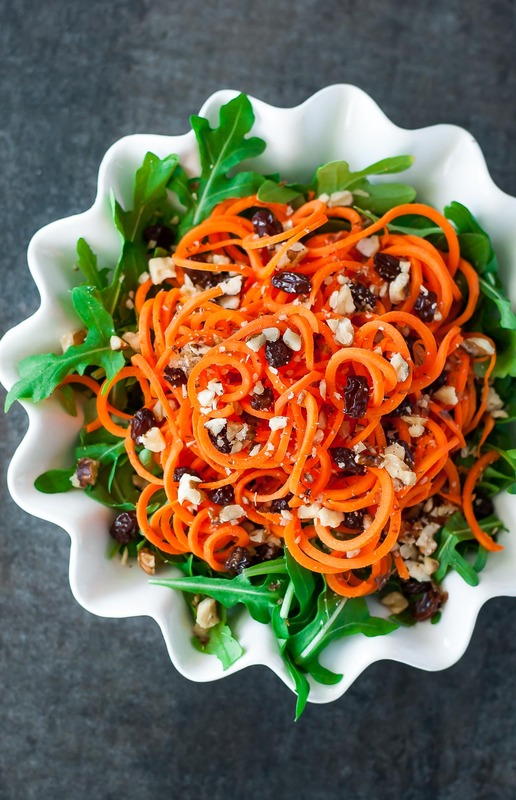 I love the carrots and raisins combo – a match made in heaven! I love carrots these days and this looks puuuurty. Spiralise a cupcake please. I brought a super cheesy meat taco dip to the super bowl party yesterday, alongside a pile of veggies and a veggie packed veggie dip. I got rave reviews on the veggie dip (they had no idea it was filled with veggies) and major compliments on the carrots. I think they’re dehydrated drunk asses were just craving any H2O, even the kind from food. Whatever the case may be, I’ll take it!! Love the sound of this combo! Im such a carrot lover, and I have the orange skin to prove it lol! People hear carrot and go “Oh that’s a vegetable! I’ll have a whole bowl!” but don’t realize the dressing is nuts! I’m with ya! This dressing has fats in the form of healthy oils and a little sweetness from honey so I feel like it’s not only less calories but worth them too! <3 Thanks Liv! We’re kind of the same person. I eat them straight up while my husband jokes that I’m going to turn orange! Hey whatever man, it’s a tan from food? I’ll take it! This looks devine! I too love carrot salad but can’t hack the southern interpretation of it. OR BOTH!!!!! Oh the humanity!